Wondering why the city is subsidizing 18,000 square feet of parking for a project that’s supposed to make fresh food more accessible to low-income New Yorkers? Political favors seem to have something to do with it. Moisha’s Discount Supermarket is receiving $2 million in tax incentives to expand its operations and build parking for 45 cars under the FRESH program, intended to bring fruits and vegetables into underserved neighborhoods. But according to a report in the Daily News, there are 10 markets within five blocks of Moisha’s and all of them sell fresh produce. The News points to $41,690 in donations from Moisha’s owners to local politicians as an alternative explanation for Moisha’s tax breaks. An article in City Hall News, which has been taken off their website (we’re looking into why), suggests more direct impropriety. 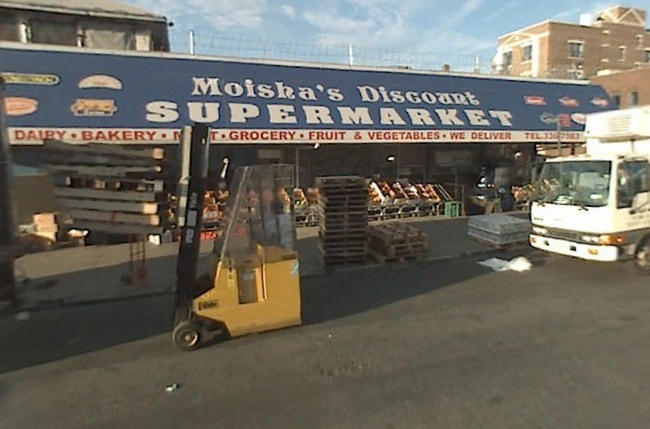 They report that the district manager of Brooklyn Community Board 12 testified to the city’s Industrial Development Agency that his board was completely behind the Moisha’s expansion. But a member of CB12 said the board had never discussed the issue. The district manager and Moisha’s owners are reported to have close ties to Assembly member and local power broker Dov Hikind. 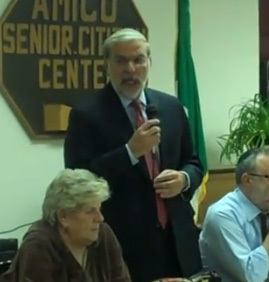 Assembly Member ##http://www.streetsblog.org/2010/12/01/dov-hikind-demagogues-against-safer-streets/##Dov Hikind## speaking against pedestrian refuges on Fort Hamilton Parkway at a CB12 meeting last November. All too often, political patronage is what determines how much parking New York City decides to build. From the city’s decision to give more parking to the Yankees in return for a luxury suite in left field to the Finance Department’s overruling of rank-and-file assessors to grant a politically-connected Jamaica parking operator non-profit status and millions in tax exemptions, too much of the city’s mushrooming parking supply is built and subsidized because of sweetheart deals. Even when political favors aren’t at work, however, it’s usually still politics that determines how much parking gets built, not any kind of thinking about transportation policy. Parking is routinely thrown in as a “sweetener” for new development, something that a developer or the city can offer a neighborhood to accept growth. It’s exceedingly rare for parking decisions to be made on the grounds of how much more traffic a garage will induce or how much air pollution it will add. No wonder the city keeps building acre after acre of it. Isn’t that the picture from the Community Board meeting where Rep. Hikind railed the DOT for pedestrian refuges that are “delaying” emergency vehicles resulting in more deaths? Well, now maybe someone should do the same to him for supporting developments that will add congestion to the streets and slow down emergency vehicles. Those extra 45 cars on the road each hour will likely delay emergency vehicles. Smells like Dov Hikind. Wouldn’t surprise me if Marty Markowitz has his paw prints on this deal as well. Good digging Noah. Please keep going. Let’s get these guys to state on the record how this is a good investment. I would agree that poor people don’t necessarily own cars, but then again the NYCHA parking lots are always full of cars. At the same time they are pouring in parking, this community board has stood against bike infrastructure and other safety improvements. This despite the fact that many local Brooklyn residents ride their bikes each morning to Yeshiva. I hope it doesn’t take the tragic death of one of these kids for the Dov Hinkinds of this world to wake up and see that bike lanes and pedestrian safety measures don’t threaten his way of life – actually, they save lives. GOOD catch (or should I say, cache) on that article taken down on City Hall News. Thanks to you, there it is, now (as it wasn’t quite, then) in the context of the boondoggle that it reveals. Investigative reporting at its best! I had no idea about this! Thank you Mr. Kazis for your excellent investigative reporting. If you’ve ever been to the CB 12 meetings, you would be astounded. It would be interesting if you did an article on the real estate/variance committee of CB 12, I’m sure you would find all sorts of interesting connections. that is until i looked at their application myself (public record- http://www.nycedc.com/AboutUs/PublicMeetings/NYCIDAPublicHearing/Documents/Moishas%20Discount%20Supermarket.pdf). they are receiving 2 million in tax breaks over 25 years, and in return the government will be receiving 3.7 million in sales tax revenue from them over the same period. the government gains here! this is an investment the government does constantly in different business spheres. for example they will give citi bank a tax incentive to stay in the manhattan as a sweetner so that they don’t move to nj. in the end they collect millions more in tax revenue. moishas did nothing illegal or even morally wrong. they applied for a grant without any evidence of bribing those officials, and qualified. adding parking and loading zones to their roof instead of the street will reduce congestion and noise, not increase it. you should be ashamed of yourself for such lousy reporting. video i found on youtube explaining the other side…. Have you found out why the article in City Hall News was taken off their website?